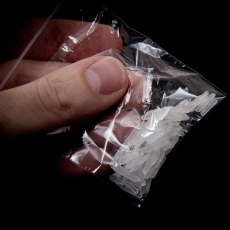 Methamphetamine - meth for short - is a very addictive stimulant drug. It is a powder that can be made into a pill or a shiny rock (called a crystal). The powder can be eaten or snorted up the nose. It can also be mixed with liquid and injected into your body with a needle. Crystal meth is smoked in a small glass pipe. Article: Methamphetamine and its immune-modulating effects.